As the health care sector steps forward in support of healthy and sustainable food systems, two critical considerations are the health and safety of the workers producing our foods. Between two and three million farmworkers across the United States are regularly exposed to toxic pesticides. Studies released by the National Institutes of Health link pesticide exposure to neurological illnesses, including Parkinson’s disease. Even contact with residual agricultural chemicals and pesticide drift has been connected to birth defects and cancer in their populations. Farmworkers are also regularly subject to heat exhaustion. For example, NPR News reported on a 17-year-old pregnant woman who collapsed and died in 2008 while tying grapevines in a California field. According to the Centers for Disease Control and Prevention, such fatalities are not uncommon, and heat is a leading cause of work-related death in agricultural workers at a rate nearly 20 times greater than that for all other U.S. civilian workers. Other problems affecting farmworkers include lower life expectancy, malnutrition, and lack of access to safe and clean housing and water, yet many of these occupational hazards go unaddressed because farmworkers are usually marginalized populations. Their socioeconomic future is vulnerable due to poor wages (often less than minimum wage), unreliable work schedules, minimal English skills, and uncertain immigration status. 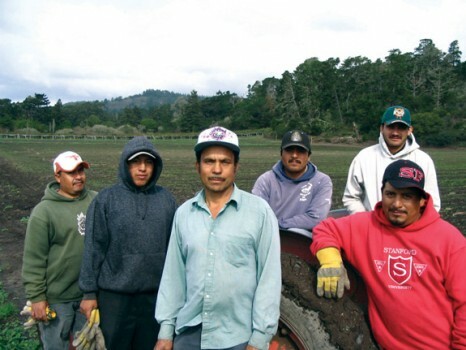 Advocacy organizations and farmworkers have begun to address these occupational and environmental issues with third-party fair labor certification. Through certification programs, accredited auditors inspect participating farms for compliance with state and national regulations, provision of fair wages for workers, and maintenance of safe working conditions that minimize workers’ exposure to chemicals. Products from complying farms are then labeled for enhanced consumer knowledge. Fair labor certification promises numerous benefits. “It offers, on a large scale, the kinds of things that farmworker unions have been trying to provide for several years,” says Margaret Reeves, senior scientist at Pesticide Action Network. It also creates avenues for the “meeting of retailers and suppliers that share core values of worker safety and environmental protection, helping to build trust and relationships with sectors and partners who haven’t typically worked together,” she continues. According to EFI’s O’Driscoll, certification creates opportunities for farmworkers to become “part of the solution to generalized concerns about food safety and pesticide use.” For example, producers can choose to train workers in preventing food safety-related problems at the point of production as part of the certification process. “Training and dialogue with management provide farmworkers with incentives to tackle these concerns,” explains O’Driscoll. * Sapna E. Thottathil is a program associate for the Healthy Food in Health Care program and a member of Physicians for Social Responsibility, San Francisco Bay chapter. This article was originally published in Greenhealth Magazine.